Spray grill rack with nonstick nonflammable cooking spray. Preheat grill to high heat (400 degree to 450 degree). Grill flat breads, covered with grill lid, for 2 minutes on one side. Using grill tongs, carefully remove flat breads from grill to baking sheets, grilled sides up. In a medium skillet, heat 1 tablespoon olive oil over medium high heat. Add onion, and cook, stirring occasionally, for 6 to 8 minutes. Brush grilled side of flat breads evenly with remaining 1 tablespoon olive oil. 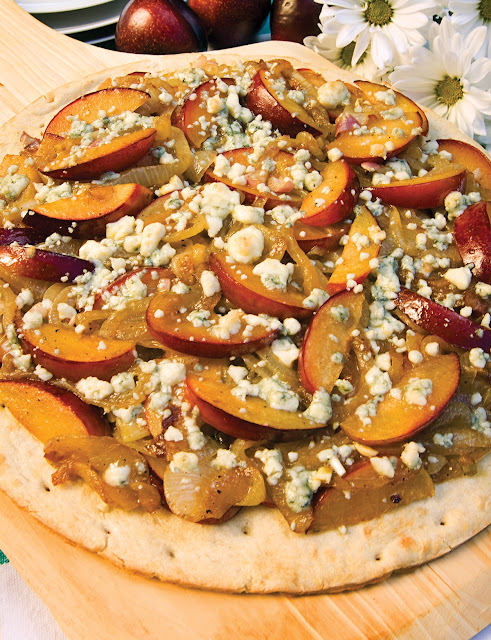 Top evenly with onion, plums, blue cheese, and pecans. Return pizzas to grill. Grill, covered with grill lid, for 4 to 5 minutes, or until toppings are heated through. To bake in an oven: preheat oven to 425 degree. On baking sheets, place flat breads. Prepare pizza according to directions. Bake for 4 to 6 minutes, or until toppings are heated though. Ends.